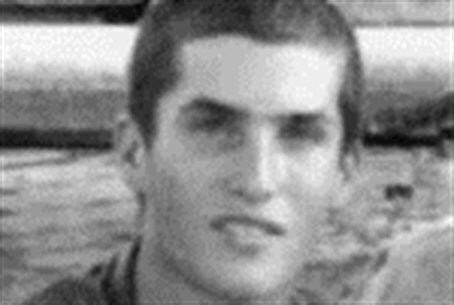 A video recalls the life and heroic death of one of four yeshiva students murdered by terrorists in the southern Hevron Hills in 2002. St.-Sgt. Noam Apter, 23, of the Samaria community of Shilo, and three fellow yeshiva students were killed in Otniel while working in the kitchen, serving the Shabbat meal to some 100 students in the adjacent dining room. Two terrorists from the nearby village of Dura in the Hebron area infiltrated Otniel on a Friday night in December, cutting the fence. They wore army uniforms, carried M-16 rifles, ammunition and hand grenades. The yeshiva, located a short distance from the fence, is located in a large, well-lit building, and the terrorists chose it as their target. About 100 yeshiva students were gathered in the ground-floor dining hall, waiting for the Friday night Shabbat meal. The two terrorists began to spray the building with bullets from the outside and one entered the kitchen via a service entrance. The four unarmed yeshiva students who were working in the kitchen were killed. St.-Sgt. Noam Apter, who was on kitchen duty, managed to lock the door to the adjoining dining room before he was shot dead, saving the lives of the students seated at the tables, who opened fire from the dining room. The two terrorists from the Islamic Jihad, which claimed responsibility for the attack, were later killed by IDF forces. Noam attended the Kfar HaRoeh yeshiva and then began his IDF service at the Otniel hesder yeshiva, combining Torah study with army service as a paratrooper. He considered going on to an officers training course, but decided first to take leave from the army to devote himself to Torah study. He settled in Otniel, dividing his time between the yeshiva and voluntary work in the community. St.-Sgt. Noam Apter was buried in Shilo. He is survived by his parents, Yossi and Pirhiya, both educators, and seven siblings. Noam's twin sister died in infancy.